The EAS Competition Kit gives users the ability to monitor EGTs and add an additional 0-100 PSIg boost and -40F to 300F temp sensors for ultimate control. This kit is designed for those truck owners who have upgraded turbo or turbos and other mods, where the stock sensors just arent enough anymore. This kit is ideal for trucks participating in dyno competitions, sled pulls, and drag racing. 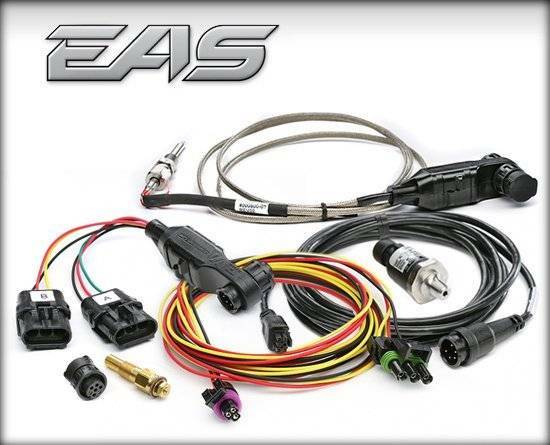 The EAS Temperature Sensor is a -40F to 300F 1/8 NPT sensor that will allow you to monitor things like Transmission Temp., Differential/Axle Oil Temp., Oil Temp., Engine Coolant Temp., Air Intake Temp., Pre and Post Intercooler Temp., and many more. Another great solution for those with aftermarket accessories.